Birth*: She was born on 22 December 1854. Marriage*: She married Aaron S. Winner on 22 November 1876. [S1] Ruth Bennett, Naudain Family of Delaware (Geneva, Neb. : n.pub., 1941), p. 79. This material is a typescript of "notes" in Ms. Bennett's possession and apparently was originally written and compiled by James W. Lattomus. Copies are with the D.A.R. Library, Washington, D.C., and Roger Bartlett, Austin, Tex., and can be viewed at http://www.rabgenealogy.com/ui53.htm. The notes contain some inconsistencies, and page 45 was missing from the D.A.R. Library copy when it was copied. Marriage*: He married Rebecca Naudain Moor, daughter of Robert H. Moor and Rebecca Naudain, on 22 November 1876. Birth*: He was born on 22 October 1858. Death*: He died in 1915. Birth*: He was born on 22 January 1861. Marriage*: He married Violetta May Craig on 17 August 1887. Marriage*: She married Winfield Scott Moor, son of Robert H. Moor and Rebecca Naudain, on 17 August 1887. [S1] Ruth Bennett, Naudain Family of Delaware (Geneva, Neb. : n.pub., 1941), p.79 (giving the date but not the place). This material is a typescript of "notes" in Ms. Bennett's possession and apparently was originally written and compiled by James W. Lattomus. Copies are with the D.A.R. Library, Washington, D.C., and Roger Bartlett, Austin, Tex., and can be viewed at http://www.rabgenealogy.com/ui53.htm. The notes contain some inconsistencies, and page 45 was missing from the D.A.R. Library copy when it was copied. [S961] Find A Grave, online at http://www.findagrave.com, memorial for Katie Naudain, memorial no. 128883561, viewed on 8 Aug 2016. [S1359] The Times, Philadelphia, Pa., online at http://www.newspapers.com, 27 Oct 1886, p. 3, col. 2. Clara Virginia Naudain Todd Pattison, Clara Naudain Todd Pattison, Clara Virginia Todd Pattison, Clara Todd Pattison, Clara Pattison, Clara Virginia Pattison. [S1] Ruth Bennett, Naudain Family of Delaware (Geneva, Neb. : n.pub., 1941), pp. 79. This material is a typescript of "notes" in Ms. Bennett's possession and apparently was originally written and compiled by James W. Lattomus. Copies are with the D.A.R. Library, Washington, D.C., and Roger Bartlett, Austin, Tex., and can be viewed at http://www.rabgenealogy.com/ui53.htm. The notes contain some inconsistencies, and page 45 was missing from the D.A.R. Library copy when it was copied. [S1350] Denton Journal, Denton, Md., online at http://www.newspapers.com, 7 May 1898, p. 3, col. 2 (obituary of James N. Todd) (not giving the date). [S1359] The Times, Philadelphia, Pa., online at http://www.newspapers.com, 13 Feb 1894, p. 5, col. 3. [S1350] Denton Journal, Denton, Md., above, 10 Jul 1926, p. 5, col. 1 (obituary of Clara Virginia Pattison). [S1350] Denton Journal, Denton, Md., above, 27 Jan 1894, p. 3, col. 8. [S1405] J. R. Witcraft, comp., Todds of the Eastern Shore Maryland (Philadelphia, Pa.: Dispatch Publishing House, 1912), online at http://www.familysearch.org, p. 20 (naming Clara Naudain as his mother). "A telegram on Sunday last announced the death of James Nathan Todd, a prominent member of the Caroline bar, at the Johns Hopkins Hospital, in Baltimore. A little over a year ago he was taken ill. His affliction, which was of the stomach, caused indigestion in its worst form, and he suffered much pain. A visit to the hospital during the latter part of April, ’97, afforded only temporary relief, and all the spring and summer he continued to grow weaker. An operation being necessary he returned to the hospital, where an eminent specialist treated him. Twice the surgeon’s knife had to be used, and from the last operation the patient derived much benefit. He returned to Denton in November, and he and his friends had strong hope that he would soon be himself again. Some weeks ago, however, the manifestations of the old disease were noticed, and Mr. Todd was again compelled to keep his room. He was again taken to the hospital, but grew rapidly worse. His condition was so weak that it was deemed inadvisable to subject him to another operation, and death came as a benison [sic] after so much suffering. "Mr. Todd was twice married, his first wife being Miss Ella Jump, a daughter of Register of Wills Robert J. Jump, and his widow was Miss Clara Naudain, of Philadelphia, and a grand-niece of United States Senator Naudain, of Delaware. Dr. Alexander Hardcastle, of this place, is an uncle. James N. Todd, Jr., aged three-and-a-half years, is the only surviving child of the deceased, two others being dead. Prof. John R. Todd, of Washington; Robert M. and George W. Todd, of New York, are brothers of the deceased, and his sisters are Mrs. W. J. Davis, of Federalsburg; Misses Grace, Mary and Alice Todd. Note*: • He was from Denton, Maryland, where he and Clara resided when he died. [S1350] Denton Journal, Denton, Md., online at http://www.newspapers.com, 7 May 1898, p. 3, col. 2 (obituary of James N. Todd). [S1350] Denton Journal, Denton, Md., above, 7 May 1898, p. 3, col. 2 (obituary of James N. Todd) (not giving the date). [S961] Find A Grave, online at http://www.findagrave.com, memorial for James Nathan Todd, memorial no. 46916410, viewed on 6 Aug 2016 (giving the date but not the place). [S961] Find A Grave, online, above, memorial for James Nathan Todd, memorial no. 46916410, viewed on 6 Aug 2016 (giving the place but not the date). [S1350] Denton Journal, Denton, Md., above, 7 May 1898, p. 3, col. 2 (obituary of James N. Todd) (giving the date but not the place). [S1350] Denton Journal, Denton, Md., above, 7 May 1898, p. 3, col. 2. [S1350] Denton Journal, Denton, Md., above, 7 May 1898, p. 3, col. 2 (obituary of James N. Todd) (stating that he was born on 5 Oct 1861) (second bullet). [S961] Find A Grave, online, above, memorial for James Nathan Todd, memorial no. 46916410, viewed on 6 Aug 2016 (stating that he was born on 15 Oct 1861) (second bullet). [S1] Ruth Bennett, Naudain Family of Delaware, above, p. 96 (naming James M. Todd as his father). [S1405] Todds of the Eastern Shore Maryland, above, p. 20 (giving his name as James Naudain Todd, Jr. and naming James Nathan Todd as his father). [S1] Ruth Bennett, Naudain Family of Delaware (Geneva, Neb. : n.pub., 1941), pp. 79, 96-97. This material is a typescript of "notes" in Ms. Bennett's possession and apparently was originally written and compiled by James W. Lattomus. Copies are with the D.A.R. Library, Washington, D.C., and Roger Bartlett, Austin, Tex., and can be viewed at http://www.rabgenealogy.com/ui53.htm. The notes contain some inconsistencies, and page 45 was missing from the D.A.R. Library copy when it was copied. Birth*: She was born on 1 December 1868. Marriage*: She married Alfred Eyer O'Brien on 3 June 1889. Note*: She lived in Brooklyn, New York and had no children. [S1] Ruth Bennett, Naudain Family of Delaware (Geneva, Neb. : n.pub., 1941), pp. 79-80. This material is a typescript of "notes" in Ms. Bennett's possession and apparently was originally written and compiled by James W. Lattomus. Copies are with the D.A.R. Library, Washington, D.C., and Roger Bartlett, Austin, Tex., and can be viewed at http://www.rabgenealogy.com/ui53.htm. The notes contain some inconsistencies, and page 45 was missing from the D.A.R. Library copy when it was copied. Marriage*: He married Carolyn Virginia Naudain, daughter of Arnold Naudain M.D. and Carolyn Virginia Ten Eyck, on 3 June 1889. Death*: He died on 4 January 1894. Marriage*: He married Carolyn Virginia Ten Eyck, daughter of Samuel Ten Eyck, before 1857. Birth*: He was born on 27 January 1862 in Castle Hall, Caroline County, Maryland. Marriage*: He married Clara Downes on 7 April 1897. Note*: He practiced law in Baltimore, Maryland for at least thirty years beginning in 1895. They had no children. [S1] Ruth Bennett, Naudain Family of Delaware (Geneva, Neb. : n.pub., 1941), p. 80. This material is a typescript of "notes" in Ms. Bennett's possession and apparently was originally written and compiled by James W. Lattomus. Copies are with the D.A.R. Library, Washington, D.C., and Roger Bartlett, Austin, Tex., and can be viewed at http://www.rabgenealogy.com/ui53.htm. The notes contain some inconsistencies, and page 45 was missing from the D.A.R. Library copy when it was copied. [S1365] The Sun, Baltimore, Md., online at http://www.newspapers.com, 10 Jul 1940, p. 19, col. 1 (obituary of Alexander Hardcastle) (naming "Dr. Alexander" as his father). [S1365] The Sun, Baltimore, Md., above, 10 Jul 1940, p. 19, col. 1 (obituary of Alexander Hardcastle). Marriage*: She married Alexander Hardcastle, son of Alexander Hardcastle M.D. and Catharine Naudain, on 7 April 1897. Note*: She was from Denton, Maryland. Marriage*: He married Elizabeth Mulford Simons on 19 April 1900. Note*: • He was a shoe manufacturer and treasurer of the Smaltz Goodwin Co. of Philadelphia. He lived in Germantown, Pennsylvania and was an elder in the Presbyterian Church. • He retired in March 1954 after more than sixty years in the shoe and leather industry. [S1] Ruth Bennett, Naudain Family of Delaware (Geneva, Neb. : n.pub., 1941), pp. 80-81. This material is a typescript of "notes" in Ms. Bennett's possession and apparently was originally written and compiled by James W. Lattomus. Copies are with the D.A.R. Library, Washington, D.C., and Roger Bartlett, Austin, Tex., and can be viewed at http://www.rabgenealogy.com/ui53.htm. The notes contain some inconsistencies, and page 45 was missing from the D.A.R. Library copy when it was copied. [S961] Find A Grave, online at http://www.findagrave.com, memorial for Elias Naudain Simons, memorial no. 91219090, viewed on 21 Jul 2018. [S1367] The Philadelphia Inquirer, Philadelphia, Pa., online at http://www.newspapers.com, 20 Sep 1954, p. 11, col. 2 (obituary for E. Naudain Simons). [S961] Find A Grave, online, above, memorial for Elias Naudain Simons, memorial no. 91219090, viewed on 21 Jul 2018 (giving the date and place but not mentioning that he died at home). [S961] Find A Grave, online, above, memorial for Elias Naudain Simons, memorial no. 91219090, viewed on 21 Jul 2018 (not giving the date). [S1] Ruth Bennett, Naudain Family of Delaware, above, pp. 80-81 (first bullet). [S1367] The Philadelphia Inquirer, Philadelphia, Pa., online at http://www.newspapers.com, 20 Sep 1954, p. 11, col. 2 (obituary for E. Naudain Simons) (second bullet). [S1] Ruth Bennett, Naudain Family of Delaware, above, p. 80 (third bullet). [S961] Find A Grave, online, above, memorial for Elias Naudain Simons, memorial no. 91219090, viewed on 21 Jul 2018 (third bullet). Marriage*: She married Elias Naudain Simons, son of M. Laird Simons and Margaret Naudain, on 19 April 1900. Birth*: He was born on 25 February 1873. Marriage*: He married Alice Putnam in November 1904. Note*: He was a leather manufacturer, president of Wm. Amer Co. of Philadelphia, and an elder in the Presbyterian Church. Marriage*: She married Laird Hardcastle Simons, son of M. Laird Simons and Margaret Naudain, in November 1904. Birth*: He was born on 2 February 1878. Note*: He was an attorney in Philadelphia, Pennsylvania. Birth*: He was born on 29 September 1851. Death*: He died on 30 June 1897 at age 45. [S1] Ruth Bennett, Naudain Family of Delaware (Geneva, Neb. : n.pub., 1941), p. 81. This material is a typescript of "notes" in Ms. Bennett's possession and apparently was originally written and compiled by James W. Lattomus. Copies are with the D.A.R. Library, Washington, D.C., and Roger Bartlett, Austin, Tex., and can be viewed at http://www.rabgenealogy.com/ui53.htm. The notes contain some inconsistencies, and page 45 was missing from the D.A.R. Library copy when it was copied. Birth*: He was born on 18 November 1856. Marriage*: He married Elizabeth Woodruff on 1 January 1876. Marriage*: He married Rosa Bell Gorsuch on 15 November 1883. Note*: He lived in Bethany, Butler County, Ohio, and had ten children. Marriage*: She married Albert Naudain Swearingen, son of George Washington Swearingen and Mary Catherine Naudain, on 1 January 1876. Marriage*: She married Albert Naudain Swearingen, son of George Washington Swearingen and Mary Catherine Naudain, on 15 November 1883. [S961] Find A Grave, online at http://www.findagrave.com, memorial for Margaret J. Naudain, memorial no. 153109096, viewed on 7 Aug 2016. [S1] Ruth Bennett, Naudain Family of Delaware, above, p. 81 (giving the date but not the place). [S1338] The Algona Upper Des Moines, Algona, Iowa, online at http://www.newspapers.com, 14 Mar 1894, p. 4, col. 2 (obituary of Margaret Naudain). [S961] Find A Grave, online, above, memorial for Margaret J. Naudain, memorial no. 153109096, viewed on 7 Aug 2016 (giving the date but not the place) (stating that she died of consumption at 8:00 p.m.). [S1338] The Algona Upper Des Moines, Algona, Iowa, above, 14 Mar 1894, p. 4, col. 2. Other Names*: Alfred Naudain, A. H. Naudain, Alf Naudain. [S1] Ruth Bennett, Naudain Family of Delaware, above, p. 97 (misstating the year as 1868). [S1] Ruth Bennett, Naudain Family of Delaware, above, p. 97 (giving the date but not the place). [S1356] The Lake Park News, Lake Park, Iowa, online at http://www.newspapers.com, 10 May 1917, p. 1, col. 1. [S1338] The Algona Upper Des Moines, Algona, Iowa, online at http://www.newspapers.com, 7 Aug 1895, p. 8, col. 3. [S1] Ruth Bennett, Naudain Family of Delaware, above, p. 97 (naming Alfred Howard Naudain as her father). [S1] Ruth Bennett, Naudain Family of Delaware, above, p. 97 (naming Alfred Howard Naudain as his father). Scrapbook*: • "W. E. Naudain is building a big addition to his house. It will be about 30x40 and 18 feet high." "ALGONA, Dec. 22 .—Two of Algona's pioneer families will celebrate their fifty-third wedding anniversary Christmas day. Mr. and Mrs. Ben Winkle were married at the Lones Lessing home on Christmas day in 1881, by the pastor of the Baptist church. Mrs. Winkle was Ida Potter before her marriage. They have one son, Clair Winkle, who lives six miles north of Algona. Mrs. Winkle is 76 years old and Mr. Winkle is 80 years old. "Mr. and Mrs. W. E. Naudain were married on the same day at the bride’s parents, Mr. and Mrs. Foster, who lived in the north part of the city, by the Rev. Mr. Good, pastor of the Free Methodist church. To this union four children were born, three are living. "Mr. and Mrs. Foster had lived on a farm northwest of Algona and while there Mrs. Winkle, who was then Miss Potter, taught the school. It was here that the girls became friends. Mr. Naudain and Mr. Winkle were not acquainted as were the girls, so neither of the girls told the other of their approaching marriage, expecting to give them a surprise later. "As Christmas in 1881 fell on Sunday Mr. and Mrs. Naudain planned to have their pictures taken on the following day. They went to Joe Nicoulin, who had the only ‘picture gallery’ in town. As they entered, they were surprised to see Mr. and Mrs. Winkle seated in the gallery ready to have their pictures taken. They then realized what had happened and since that day both families have been very close friends. "Both families have lived in Kossuth county since their marriage. "Mr. and Mrs. Winkle are celebrating the occasion with a Christmas dinner, their son and family as their guests. "William Eliason Naudain, 79 years and 11 months old, and a resident of Algona since 1880, died a few minutes past midnight, early Wednesday morning, after an illness of several weeks. "Mr. Naudain was born Jan. 26, 1860, at Monroe, Iowa, the son of Robert M. Naudain and Malinda Acklin Naudain. Until a young man of 16, Mr. Naudain lived at Monroe, and in 1880 he came to Algona. Here he met and married, on Dec. 25, 1881, Ella A. Foster, who survives him, and the family has lived here ever since. "Four sons were born to the couple, Earl Robert Naudain of Glendale, Calif., Vivian Ray Naudain, deceased, Vallo V. Naudain of Algona, and Glenn G. Naudain of Rock Hill, South Carolina. Earl arrived a week ago to be with his parents, and Dr. Glenn Naudain will arrive Friday morning. "During his business career in Algona, Mr. Naudain engaged in the dray business and the coal business, and the business is at present being operated by his son, Vallo. "Funeral services will be held Friday afternoon at two o’clock, Dec. 22, at the Methodist church, with Rev. F. Earl Burgess officiating. Burial will be in Riverview cemetery. [S1338] The Algona Upper Des Moines, Algona, Iowa, above, 21 Dec 1939, p. 1, col. 1 (obituary of William Eliason Naudain) (naming Malinda Acklin as his mother). [S1145] Riverview Cemetery, Algona, Iowa, online http://iagenweb.org/kossuth/cemetery/Riverview-Algona.htm, viewed 18 Aug 2007 (giving the year but not the place). [S1338] The Algona Upper Des Moines, Algona, Iowa, above, 21 Dec 1939, p. 1, col. 1 (obituary of William Eliason Naudain). [S1440] Upper Des Moines-Republican, Algona, Iowa, online at http://www.newspapers.com, 23 Dec 1931, p. 1, col. 5. [S1338] The Algona Upper Des Moines, Algona, Iowa, above, 27 Apr 1954, p. 1, col. 4 (obituary for Ella Foster Naudain). [S1145] Riverview Cemetery, Algona, Iowa, online, above, viewed 18 Aug 2007. [S1342] The Republican, Algona, Iowa, online at http://www.newspapers.com, 23 Aug 1899, p. 7, col. 4 (first bullet). [S1338] The Algona Upper Des Moines, Algona, Iowa, above, 7 Aug 1895, p. 8, col. 3 (second bullet). [S1446] Mason City Globe-Gazette, Mason City, Iowa, online at http://www.newspapers.com, 24 Dec 1934, p. 14, cols. 5-6. [S1338] The Algona Upper Des Moines, Algona, Iowa, above, 21 Dec 1939, p. 1, col. 1. [S1] Ruth Bennett, Naudain Family of Delaware, above, p. 97 (naming William Eliason Naudain as his father). [S1338] The Algona Upper Des Moines, Algona, Iowa, above, 21 Dec 1939, p. 1, col. 1 (obituary of William Eliason Naudain) (naming William Eliason Naudain as his father). Advertisement, The Daily Argus-Leader, Sioux Falls, S.D., 14 Jan 1929, p. 1, col. 5. 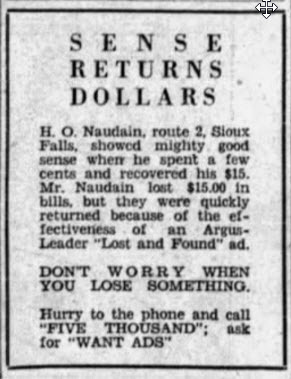 Image of advertisement on front page of newspaper about how H. O. Naudain ran an advertisement in the lost and found section of the newspaper and for a few cents recovered $15.00 he had lost. The Daily Argus-Leader, Sioux Falls, South Dakota, Monday, January 14, 1929, page 1, bottom of col. 5. Other Names*: Homer Naudain, Oscar Naudain, Oz Naudain. Scrapbook*: • "The marriage of Oscar Naudain and Sarah Harvey last Wednesday is the occasion of hearty congratulations. Mr. Naudain is the younger brother of the well known Naudain boys and Miss Harvey is a daughter of our old and well known early settler, C. I. Harvey. Many good wishes go with them, in which the Upper Des Moines heartily joins. The make their home in the Henry Walston house." • "HIS HAND TAKEN OFF. "Oscar Naudain the Unfortunate Victim of a Bad Accident. "Oscar Naudain suffered a great misfortune last Friday [8 Jan 1892], losing his left hand in C. B. Hutchins’ clover huller. They were at work northeast of Burt, and Oscar by some means put his hand near some tearing hooks, which caught it and scraped every bit of flesh and tissue from the front of the hand, besides tearing out the bones. The injured man was brought to Burt, but too late for the train and had to lay over till Saturday before getting home. Drs. Morse and Pride were called and Sunday amputated the hand at the wrist. This is a bad loss to an active young man, and one his friends will all join in regretting." • "Oscar Naudain is out on the streets again. His arm is healing as well as could be expected." Obituary*: "OSCAR NAUDAIN DIES AT SIOUX FALLS, S.D. "W. E. Naudain has received the news of the death of his twin brother, Oscar Naudain at his home near Sioux Falls, South Dakota, which occurred Sunday morning, July 2, from heart trouble. His death came suddenly after being troubled with the ailment for some time. The funeral was to be held Wednesday, July 5, and burial was to be made at Sioux Falls. "Homer Oscar Naudain was born a twin of W. E. Naudain in Marion county, Iowa, January 26, 1860, and was in his seventy-fourth year. He came to Algona in 1885 and was a thresher and grading contractor with the late Geo. Johnson for some years. He married Sarah Harvey, a sister of Frank Harvey of Algona, and they moved to the McWhorter farm just south of Burt. Three children were born, two of whom died in infancy, the surviving daughter, now Mrs. Camilla Bailey, and the widow live at Sioux Falls. Note*: • He was the twin of his brother William. • He and Sarah had three children, two of whom died in infancy. • He "was known to his intimates as 'Oz' [and] still has many friends in Algona [Iowa] which he visited frequently since his removal to Sioux Falls [S.D. ], and he will be remembered kindly here. He was of a genial disposition and an upright and honorable man who met all of life's obligations fairly." His Find A Grave memorial, which includes a picture of his tombstone, is here. [S961] Find A Grave, online at http://www.findagrave.com, memorial for viewed on 3 Apr 2010 (Homer O. Naudain, memorial no. 50594699) (giving the year but not the day or place). [S961] Find A Grave, online, above, memorial for viewed on 3 Apr 2010 (Homer O. Naudain, memorial no. 50594699) (stating that he was born in Marion County, Iowa; not giving the date but stating that he was seventy-two years old when he died on 2 Jul 1933). [S1338] The Algona Upper Des Moines, Algona, Iowa, online at http://www.newspapers.com, 17 Dec 1890, p. 8, col. 2. [S1338] The Algona Upper Des Moines, Algona, Iowa, above, 5 Jul 1933, p. 1, col. 2 (obituary for Oscar Naudain) (not giving the date or place). [S961] Find A Grave, online, above, memorial for viewed on 3 Apr 2010 (Homer O. Naudain, memorial no. 50594699) (giving the year but no other information). [S1442] The Daily Argus-Leader, Sioux Falls, S.D., online at http://www.newspapers.com, 3 Jul 1933, p. 2, col. 2 (obituary for Homer Oscar Naudain) (stating that he died "following a lingering illness"). [S1338] The Algona Upper Des Moines, Algona, Iowa, above, 5 Jul 1933, p. 1, col. 2 (obituary for Oscar Naudain) (stating that he died that morning from heart trouble). [S961] Find A Grave, online, above, memorial for viewed on 3 Apr 2010 (Homer O. Naudain, memorial no. 50594699) (not giving the date). [S1442] The Daily Argus-Leader, Sioux Falls, S.D., above, 3 Jul 1933, p. 2, col. 2 (obituary for Homer Oscar Naudain). [S961] Find A Grave, online, above, memorial for viewed on 3 Apr 2010 (Homer O. Naudain, memorial no. 50594699). [S1338] The Algona Upper Des Moines, Algona, Iowa, above, 17 Dec 1890, p. 8, col. 2 (first bullet). [S1338] The Algona Upper Des Moines, Algona, Iowa, above, 13 Jan 1892, p. 5, col. 3 (second bullet). [S1342] The Republican, Algona, Iowa, online at http://www.newspapers.com, 24 Feb 1892, p. 4, col. 2 (third bullet). [S1338] The Algona Upper Des Moines, Algona, Iowa, above, 17 Dec 1890, p. 8, col. 2 (fourth bullet). [S1338] The Algona Upper Des Moines, Algona, Iowa, above, 5 Jul 1933, p. 1, col. 2. [S1338] The Algona Upper Des Moines, Algona, Iowa, above, 5 Jul 1933, p. 1, col. 2 (obituary for Oscar Naudain) (second bullet). [S1338] The Algona Upper Des Moines, Algona, Iowa, above, 5 Jul 1933, p. 1, col. 2 (obituary for Oscar Naudain) (third bullet). [S1445] Kossuth County Advance, Algona, Iowa, online at http://www.newspapers.com, 6 Jul 1933, p. 5, col. 2 (obituary for Oscar Naudain). [S1] Ruth Bennett, Naudain Family of Delaware, above, p. 97 (naming Homer Oscar Naudain as her father). Other Names*: Ella Amanda Foster Naudain, Ella Amanda Naudain, Ella Foster Naudain, Ella Naudain. "Funeral services for Ella Foster Naudain, 92, a resident of Algona for 55 years, will be held at her home at 303 Elm Street at 2 p.m. Thursday. "Rev. G. G. Hallauer will officiate and Richardson’s are in charge of the arrangements. "Mrs. Naudain died Monday evening. "Ella Amanda Foster was born February 7, 1862, at Schenectady, N. Y., the daughter of Tilden Steven Foster and Betsy Etherington, both of London, England. "The family moved from New York to Illinois in 1868 and came by covered wagon to Algona in the fall of 1869 where they lived first in a house on North Jones St. and then moved to a claim which later was the town site of Lone Rock. [S1145] Riverview Cemetery, Algona, Iowa, online http://iagenweb.org/kossuth/cemetery/Riverview-Algona.htm, viewed 18 Aug 2007 (giving the year but no other information). [S1338] The Algona Upper Des Moines, Algona, Iowa, online at http://www.newspapers.com, 27 Apr 1954, p. 1, col. 4 (obituary for Ella Foster Naudain). [S961] Find A Grave, online at http://www.findagrave.com, memorial for Ella A. Foster Naudain, memorial no. 66278988, viewed on 21 Jul 2018 (giving the year but no other information). [S1338] The Algona Upper Des Moines, Algona, Iowa, above, 27 Apr 1954, p. 1, col. 4 (obituary for Ella Foster Naudain) (stating that she died that evening). [S961] Find A Grave, online, above, memorial for Ella A. Foster Naudain, memorial no. 66278988, viewed on 21 Jul 2018 (not giving the date). [S1338] The Algona Upper Des Moines, Algona, Iowa, above, 27 Apr 1954, p. 1, col. 4 (with obvious typographical errors corrected). Her Find A Grave memorial, which includes a picture of her tombstone, is here. [S961] Find A Grave, online at http://www.findagrave.com, memorial for viewed on 3 Apr 2010 (Sarah M. Naudain, memorial no. 50594659). Tombstone for Lillian Naudain Biggs, Forest Presbyterian Church Cemetery, Middletown, Del., courtesy of James Ethridge. Other Names*: Lily Naudain Biggs, Lily Biggs, Lillian Naudain Biggs, Lillian Biggs. Scrapbook*: "Marriage of a Son of Gov. Biggs. [S1340] The Morning News, Wilmington, Del., online at http://www.newspapers.com, 15 Oct 1902, p. 1, col. 3 (obituary of George W. W. Naudain) (Naming George W. W. Naudain as her father). [S1343] Journal-Every Evening, Wilmington, Del., online at http://www.newspapers.com, 15 Jul 1943, p. 29, col. 2 (obituary of Mrs. Lillian N. Biggs) (not giving the date but stating that she was seventy-three years old when she died on 13 Jul 1943). [S1343] Journal-Every Evening, Wilmington, Del., above, 15 Jul 1943, p. 29, col. 2 (obituary of Mrs. Lillian N. Biggs) (identifying her as the widow of Willard B. Biggs but not giving the date or other information about their marriage). [S1343] Journal-Every Evening, Wilmington, Del., above, 15 Jul 1943, p. 29, col. 2 (obituary of Mrs. Lillian N. Biggs) (stating that she died in the evening of a heart attack that she suffered about three hours earlier). 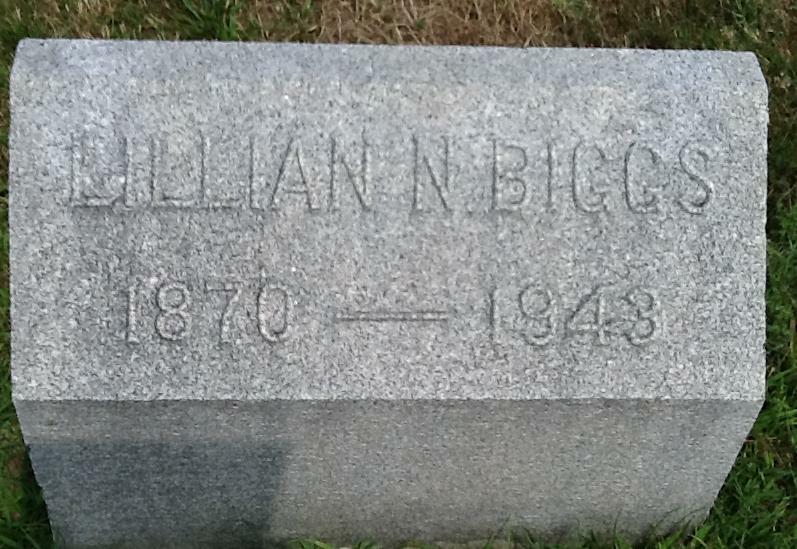 [S961] Find A Grave, online at http://www.findagrave.com, memorial for Lilian N. Biggs, memorial no. 133982111, viewed on 16 Jul 2018. [S1365] The Sun, Baltimore, Md., online at http://www.newspapers.com, 24 Feb 1888, p. 6, col. 3. [S1343] Journal-Every Evening, Wilmington, Del., above, 15 Jul 1943, p. 29, col. 2 (obituary of Mrs. Lillian N. Biggs). [S1441] Wilmington Morning News, Wilmington, Del., above, 7 Mar 1932, p. 9, col. 5 (obituary of Willard B. Biggs) (naming Mary Scott Beekman Biggs as his mother). [S1441] Wilmington Morning News, Wilmington, Del., above, 7 Mar 1932, p. 9, col. 5 (obituary of Willard B. Biggs) (not giving the date but stating he was sixty-nine years old when he died on 4 Mar 1932). [S1343] Journal-Every Evening, Wilmington, Del., online at http://www.newspapers.com, 15 Jul 1943, p. 29, col. 2 (obituary of Mrs. Lillian N. Biggs) (identifying her as the widow of Willard B. Biggs but not giving the date or other information about their marriage). [S1441] Wilmington Morning News, Wilmington, Del., above, 7 Mar 1932, p. 9, col. 5 (obituary of Willard B. Biggs) (stating that he died "due to a heart attack"). [S1441] Wilmington Morning News, Wilmington, Del., above, 7 Mar 1932, p. 9, col. 5 (obituary of Willard B. Biggs). Marriage*: She married John Boyer Cooke on 19 July 1907 in Forrest Presbyterian Church, Middletown, New Castle County, Delaware. Other Names*: Helen May Naudain Cooke, Helen Naudain Cooke, Helen May Cooke, Helen Cooke. "Miss Helen M. Naudain Became the Bride of John Boyer Cooke Last Evening. "MIDDLETOWN, July 19 .—In Forrest Presbyterian Church last evening Miss Helen May Naudain, daughter of the late G. W. W. Naudain, was married to John Boyer Cooke, formerly of Colorado, now living in Philadelphia. The church was decorated in “mist,” yellow daisies and ferns. The Rev. G. P. Jones, of Bethesda M. E. Church performed the ceremony, using the ring service. Miss Helen Biggs, of Middletown, and Miss Lucile Cooke, of Colorado, were flower girls. They wore white dresses with pink ribbons and carried large bouquets of pink and white sweet peas. "The bride wore a handsome white lace robe made over taffeta and carried sweet peas and ferns. "H. B. Biggs, Dr. J. Allen Johnson, G. Lindsay Cochran and Dr. J. C. Stites, all of Middletown; Oscar Goodhand, of New York, and Emerson Polk, of Pocomoke city, were the ushers. [S1448] Journal-Every Evening, Wilmington, Del., above, 10 Mar 1956, p. 25, col. 3 (obituary for Mrs. Helen N. Cooke) (naming Catherine Eliason Naudain as her mother). [S1] Ruth Bennett, Naudain Family of Delaware (Geneva, Neb. : n.pub., 1941), (giving the date but not the place). This material is a typescript of "notes" in Ms. Bennett's possession and apparently was originally written and compiled by James W. Lattomus. Copies are with the D.A.R. Library, Washington, D.C., and Roger Bartlett, Austin, Tex., and can be viewed at http://www.rabgenealogy.com/ui53.htm. The notes contain some inconsistencies, and page 45 was missing from the D.A.R. Library copy when it was copied. [S961] Find A Grave, online at http://www.findagrave.com, memorial for Helen Naudain Cooke, memorial no. 133982230, viewed on 3 Jul 2016 (giving the year but no other information). [S1448] Journal-Every Evening, Wilmington, Del., above, 10 Mar 1956, p. 25, col. 3 (obituary for Mrs. Helen N. Cooke) (giving the place but not the date). [S1448] Journal-Every Evening, Wilmington, Del., above, 10 Mar 1956, p. 25, col. 3 (obituary for Mrs. Helen N. Cooke). [S961] Find A Grave, online, above, memorial for Helen Naudain Cooke, memorial no. 133982230, viewed on 3 Jul 2016. [S1448] Journal-Every Evening, Wilmington, Del., above, 10 Mar 1956, p. 25, col. 3 (obituary for Mrs. Helen N. Cooke) (identifying the cemetery as Forest Cemetery). [S1337] The Evening Journal, Wilmington, Del., above, 19 Jul 1907, p. 1, col. 4. Marriage*: He married Helen May Naudain, daughter of George Washington Wesley Naudain and Catharine Amelia ('Kate') Eliason, on 19 July 1907 in Forrest Presbyterian Church, Middletown, New Castle County, Delaware. [S1337] The Evening Journal, Wilmington, Del., online at http://www.newspapers.com, 19 Jul 1907, p. 1, col. 4. Other Names*: Katherine Naudain Goodhand, Katherine Goodhand. [S1] Ruth Bennett, Naudain Family of Delaware (Geneva, Neb. : n.pub., 1941), p. 82 (naming George Washington Wesley Naudain as her father). This material is a typescript of "notes" in Ms. Bennett's possession and apparently was originally written and compiled by James W. Lattomus. Copies are with the D.A.R. Library, Washington, D.C., and Roger Bartlett, Austin, Tex., and can be viewed at http://www.rabgenealogy.com/ui53.htm. The notes contain some inconsistencies, and page 45 was missing from the D.A.R. Library copy when it was copied.